Betting for this week's Hero World Challenge leads with world number two Justin Rose, but the headlines are all about Tiger Woods. It was 12 months ago in the Hero World Challenge, that we got a first sniff that the latest Tiger Woods comeback might be the one. It was quite thrilling to watch him hit the ball with less hesitancy than for some while. Tiger finally resembled the golfer of old. Three starts ago the promise of that week was fulfilled when Woods won the Tour Championship in stunning style, but since then he has been a distant and downbeat figure in the Ryder Cup, and a not especially engaged one in last week’s The Match against Phil Mickelson. Hopefully his own tournament will prompt more hope for 2019, rather than leaving us with more questions of the future, the odds certainly suggest this to be so: the Hero World Challenge betting finding it hard to split Rose, Dustin Johnson, Woods, and last year's winner Rickie Fowler. 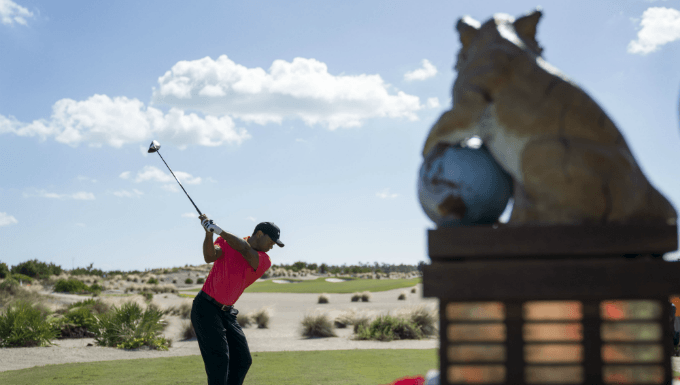 This week witnesses the 20th edition of the Hero World Challenge, now hosted by Tiger Woods. For most of its existence it was played in California, but in 2016 it moved to the Bahamas, where Bubba Watson, Hideki Matsuyama and Rickie Fowler have prevailed. Big names win it and for one obvious reason: only big names get invited. It’s an elite 18-player field played at a luxury resort, founded by a group that includes Justin Timberlake, which hosts an Ernie Els-designed golf course and features a colonial mansion that was once owned by the creator of Inspector Gadget. Hot form matters. Watson had five top fives in his previous nine starts, Matsuyama had won three of his last five, and Fowler had been second in two of his previous three (each one of them was also top three last time out). All three were PGA Tour winners in the calendar year and each had finished T7 or better in Florida that year (the resort courses, grass and blustery trade winds resemble this week’s test). At the European Tour’s seasonal finale the DP World Tour Championship, the trends left us with a short list that included winner Danny Willett. Unfortunately, some clever chap thought he hadn’t putted well on the course in the past (holding hands up). If we follow the profiling above, only three players arrive in The Bahamas having finished top three last time out and also posessing a top seven finish in Florida this season. The first is the host Tiger Woods, but you might argue that his form is a little less stellar than it was when he won the Tour Championship. He has since limped (literally, possibly; metaphorically, definitely) round Paris in the Ryder Cup and then looked a little tentative in last week’s tussle with Phil Mickelson. If you fancy Tiger was just knocking off the rust in Las Vegas, he’s 10/1 with Unibet. More interesting is Bahamas resident and world number two Justin Rose. His last six results read: 2-2-4-8-3-1, he thrashed a 62 in the final round here in 2015 and was fifth last year. He’s best odds 8/1 with BetVictor. The biggest odds for the trends is Hero World Challenge debutant Bryson DeChambeau. His form? Sensational, and in fact Hideki Matsuyama-like: three wins in his last five starts (13 times in his last 20 rounds he has shot 67 or lower). And his Florida record in 2018? He was second in the Arnold Palmer Invitational at Bay Hill. I’ll take the 11/1 with William Hill. It doesn’t take Xander Schauffele long to feel at home. He finished fifth on his second start as a full PGA Tour member, opened his major championship career with fifth in the U.S. Open, and thrashed a final round 65 on his Open Championship debut. The first time he was top five on the PGA Tour with 18 holes to play he won, he also claimed victory in his first Tour Championship and was second on his Players’ Championship debut at TPC Sawgrass earlier this year. He also appears unaffected by top quality opposition, because in addition to the above, he has also collected second place in this year’s Open Championship and won the World Golf Championship’s HSBC Champions in China. His game is neat: he hits it a long way, if not insane distances, his iron play is solid, his work around the greens has great touch and he putts well. More than anything, though, he seems to have a remarkable temperament. He makes a fine each-way option at 20/1 with Betfair Sportsbook.